Yesterday, Sleeping Dogs developer United Front revealed the first trailer for Triad Wars , which it called an "open world online" game. Not surprisingly, it looks a lot like Sleeping Dogs. It's still set in Hong Kong and features the same driving, shooting, and fighting mechanics, but is somehow, vaguely, a multiplayer game. Today, the United Front team answered questions from fans on a Reddit Ask Me Anything thread, which clarified a few things. First of all, yes, Triad Wars for now is planned as a free-to-play game, even if United Front avoided the term in the reveal trailer. Producer Justin Bullard said that monetization is one of the things United Front will test during its beta tests, but that its guiding principle is that you should never have to pay in order to enjoy the game. "Free to play allows us to get the game to as many players as possible with the lowest possible barrier to entry," he said. "That suits our goal of exposing a massive number of gamers to the Sleeping Dogs universe." 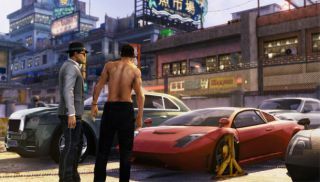 Design Director Steve Ferreira also clarified that "Triad Wars is about competing against a smaller set of players in an asynchronous world," so it doesn't sound like you'll be running around Hong Kong with hundreds of other live players at the same time. Between what United Front says in the AMA and the few glimpses of building customization we see in the trailer, I imagine that you'll be setting up defenses at your hideout and attacking other players who are doing the same (maybe a little bit like The Mighty Quest for Epic Loot ), but it's too soon to say for sure. United Front said that it's still finalizing dates for the beta tests, but the Closed Beta registrations are now open if you're interested. As for a proper Sleeping Dogs sequel, United Front said only that it "would love to continue making games in the Sleeping Dogs universe."